After months of relative quiet for the city, a rocket fired from Gaza has hit central Ashkelon. A Grad rocket fired by Gaza terrorists hit an open area near a residential neighborhood in Ashkelon on Friday morning. No physical injuries were reported, although several people suffered shock and required medical attention. A vehicle was damaged. Ashkelon had experienced relative quiet following the Cast Lead counterterror operation in Gaza in early 2009. 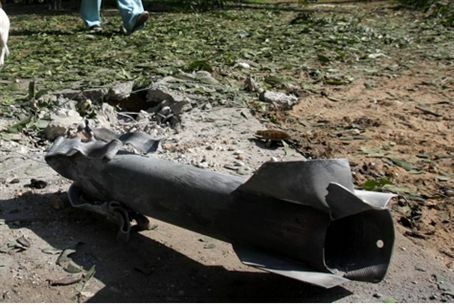 The attack follows an attack last week that was carried out using an imported rocket more sophisticated than the short-range “Kassam” rockets produced in Gaza. In that case, the rocket failed to explode, and no injuries were reported. Prime Minister Binyamin Netanyahu has followed a policy of quick response to attacks from Gaza. Air Force planes have demolished smuggling tunnels and weapons factories in the region following previous rocket attacks.